The Grenoble Institute of Technology (Grenoble INP) is one of Europe’s leading technology universities, at the heart of innovation from more than a century. Ideally located in the heart of the French Alps, Grenoble INP is one of Europe’s leading technology universities. It offers a range of engineering, masters and doctoral courses both in French and in English, driven by world-class research in 37 laboratories, and 6 state-of-the-art technology platforms, developped in partnership with other institutions. Grenoble INP’s mission is to empower new generations of engineers to respond to global challenges in the fields of energy, the digital world, micro- and nanotechnologies, the environment, as industries of the future. For 120 years, Grenoble INP has been instrumental in developping innovative solutions with industrial partners to support continuous technological advances and economic growth. Read more. The School responsible for FAME+ programme at Grenoble INP is School of Engineering in Physics, Applied Physics, Electronics and Materials Science. The Technische Universität (TU) Darmstadt is one of Germany’s leading technical universities. Its around 312 professors, 4,244 employees and 26,000 students devote their talents and best efforts to the significant future research fields energy, mobility, communications and information technologies, housing and living conditions. The wide variety of disciplines represented are all focused on technology, as viewed from the vantage point of engineering, the natural sciences, the humanities, and the social sciences, and cover the full range of academic endeavour, from the origination of basic concepts to practical, everyday applications. The TU Darmstadt is Germany’s first autonomous university and has a state-funded budget of 293 million Euros (2013, incl. building funds). Its capacity for innovation is evidenced inter alia by the steady growth in annual funding received from outside sources. The 147 million Euros contributed by industry, the Deutsche Forschungsgemeinschaft, and the European Union for 2013 make it one of Germany’s leading academic recipients of third party funding. In renowned rankings by the Deutsche Forschungsgemeinschaft, the Alexander von Humboldt Stiftung, and the Zentrum für Hochschulentwicklung, as well as polls of the personnel directors of major corporations, it has consistently corroborated its leadership in research, academic excellence, and its qualification of graduates for top jobs and successful careers. TU Darmstadt has established the university-wide umbrella organisation Ingenium to support early career researchers (doctoral candidates and postdocs). Ingenium provides a course program on professional and social skills to acquire key competencies such as project management, leadership skills, or teaching skills. To ensure the high quality of the courses, target group-specific and demand-oriented courses conducted by external trainers are offered. Read more. See also: Material Science Department. The Institute for Physics of Augsburg University was founded in 1989 and is devoted to research in anorganic materials, but during the last decades evolved strongly towards different branches of materials science. Fields in functional materials cover topics like oxidic superconductors, multiferroics, magnetic materials, optical nanomaterials like quantum dots, mesoporous materials, organic semiconductors, biomaterials and thermoelectrics. Another focus of research are structural light-weight materials like light metal alloys and especially composites like carbon fiber reinforced polymers or nanocomposites. Many material properties are controlled by their microstructure, their defects but also by surfaces and interfaces. The Institute is part of several national and international collaborations like the Cluster of Excellence NIM (Nano-initiative Munich), the BMBF leading-edge cluster MAI Carbon (Munich-Augsburg-Ingolstadt Carbon cluster) or the Transregio TRR80 Fromelectronic correlations to functionality. During the past period of the FAME program the institute hosted together with INP Grenoble the first year students. The University of Aveiro has three main research laboratories/groups working in the field of materials science and engineering which are part of the Institute of Nanotechnology of Aveiro (www.ua.pt/research/PageText.aspx?id=16668). Whithin this rich environment, the Associated Laboratory CICECO – Aveiro Institute of Materials, has played and will continue to play a key role in the training of FAME students. This Associated Laboratory was created in 2002, joins almost 400 chemists, physicists and materials engineers making it the largest Portuguese Materials Science and Engineering (MS&E) institute (www.ciceco.ua.pt). CICECO is organized in 5 main research groups: Inorganic Functional Nanomaterials and Organic-Inorganic Hybrids; Multifunctional Ferroic Ceramics and Nanostructures; Materials for Energy and Functional Surfaces; Biorefineries, Biobased Materials and Recycling; Biomedical and Biomimetic Materials. 33% of 27 full-time researchers, 29% of 83 post-docs and 28% of 116 PhD students are non-nationals. In the last 5 years (2011-2015), 2145 SCI were published papers, 103 PhD and 401 MSc theses were finished, and 43 patents (19 international) were filed. At present, 4 spin-offs are running or being created and we have over 1.7 M€ projects running with companies (and many other with national and European funding). The instrumental facilities of CICECO are the best in the country for MS&E, including SEM, TEM, AFM, X-ray diffraction, NMR, vibrational spectroscopies, measurement of optical, magnetic, electric, thermal, mechanical properties, a computer cluster, etc. With a history that dates back to the year 1441, the University of Bordeaux was newly established in January 2014 following the merger of three universities. Ranked among the top universities in France for the quality of its academic courses and research, the University of Bordeaux was awarded the “Initiative of Excellence” by the French government in 2011, and is one of only three universities in France to obtain confirmation of this program in 2016. A multidisciplinary institution, the University of Bordeaux offers 245 Master and 125 Bachelor programs. Renowned for the excellence of its research, 9 thematic clusters of excellence exist within the domains of: neuroscience, medical imaging, environment/climate, advanced materials, archeology, lasers/optics, digital certification, health and society, cardiology. The university welcomes 53, 000 students, of which almost 2, 000 are PhD students and 6, 200 (12%) are international students. A wide range of international study programs exist at all levels that offer students courses taught in English or other languages, mobility opportunities, and/or the possibility to complete joint or double degrees. For more information, please consult our website. The University of Liège (ULiège) is the only public, pluralist and complete university institution of the French-speaking Walloon-Brussels community. It aims at maintaining a fair balance between teaching, research and community service activities, in the broad lines recognised by its complete university status. Fully integrated in the Bologna process aiming at establishing a large harmonised region of higher education in Europe, ULiège welcomes more than 23 000 students (of which 23% are foreigners) spread out over 11 Faculties. The University offers a very large range of course programs: 38 bachelors courses, 196 masters courses and 64 complementary masters courses. Located at the crossroads of the German and Latin cultures, with a global outlook on international aspects, the University of Liège devotes a considerable part of its teaching to foreign language classes in order to ensure that its students are citizens who are truly active on a European level. It encourages the integration of new types of teaching (problem-solving, supervised training sessions, role-plays, …) and the acquisition of combined skills. 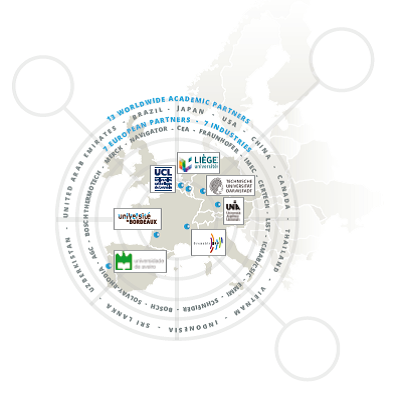 As in all of the universities in Europe and throughout the world, the teaching at ULiège is kept alive through research. This teaching-research complementarity is at the heart of the university project. ULiège pays special attention to fundamental research, the basis of new knowledge. Although the University supports specific research orientations that it deems as priorities, it intentionally nurtures as well all other disciplines, thus preserving the status of the Institution as a complete university.